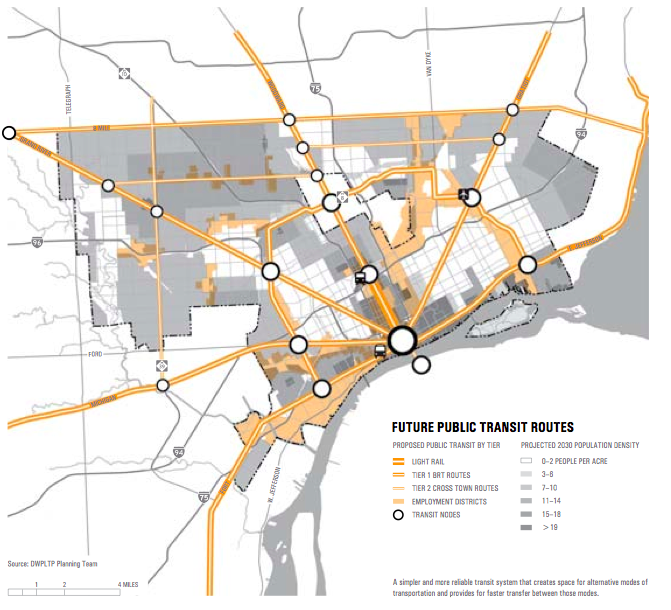 Last week the Detroit Works Project released their long awaited strategic plan for the city. This is the one led by Toni Griffin that produced a lot of public controversy because of suggestions it would result in the planned shrinkage or decommissioning (or even forced residential relocations) in sparsely populated neighborhoods. 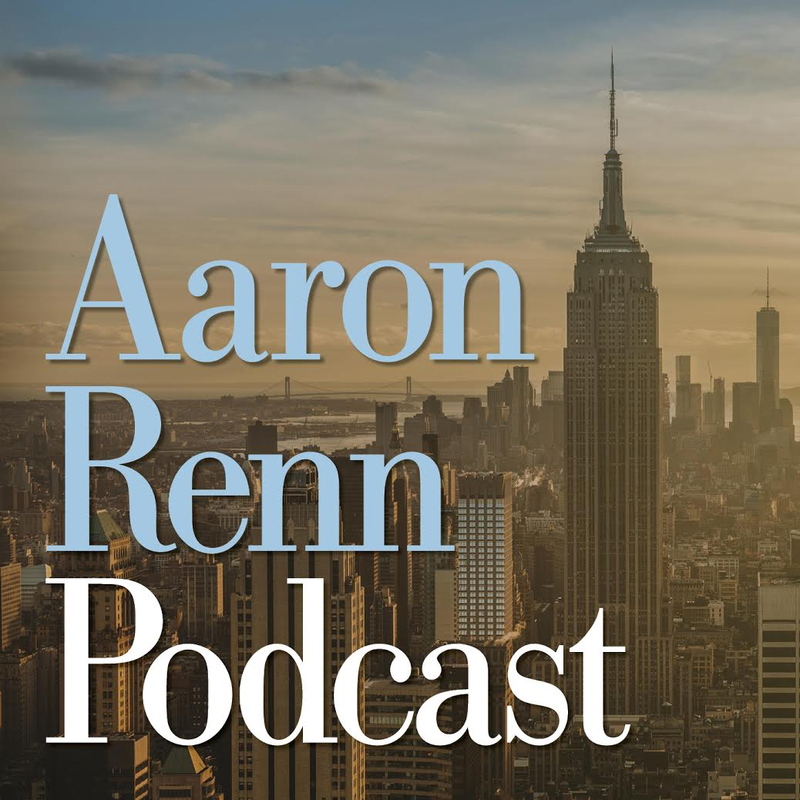 Aaron, I agree with some of your points on Detroit Future City. The online format is terribly un-user-friendly. And the 2030 job growth target was just plain crazy (I bet that’s something brought up by Detroit old-timers who want a return to the days when 2-3 jobs per resident was reality, in the ’50s and ’60s). But I think you sell the innovation of the plan a little short. 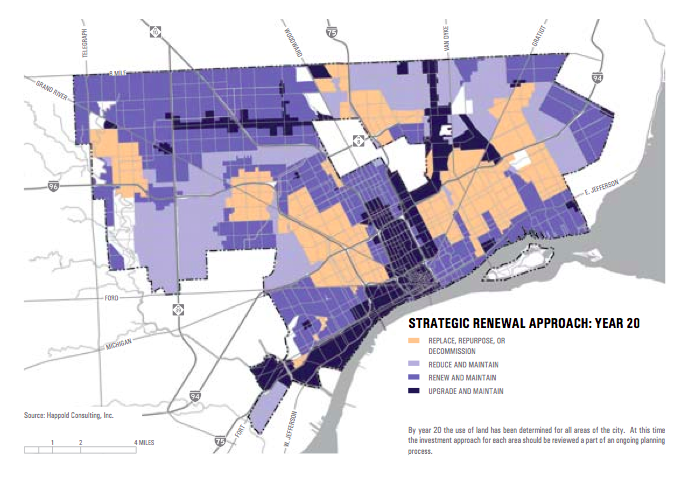 I was disappointed that the plan did not address the lack of neighborhood identity in Detroit. In fact it seemed they tried to create neighborhood identity in areas where there is none. But I was pleased to see how they propose to create distinct neighborhoods in the more intact parts of the city, in terms of density and housing choices. Detroit can be horribly homogeneous in its housing. As far as the eds and meds focus goes, I think the planning team simply wanted Detroit to give its full attention to its eds and meds assets so that it can contribute more fully to the city’s economy (I’d agree that Wayne State and the Detroit Medical Center are not nation leaders, but they can be region leaders). The green focus of the plan did resonate with me because it uses green development in a context I’ve never seen before in a major city. I urge you to look again — this plan effectively calls for the decommission of some 20% of the city without explicitly saying so, either through urban ag, the continued reintroduction of forests and/or prairies, or “blue/green” infrastructure. The plan also calls for very low density residential land use typologies adjacent to the decommissioned areas, generally clustered development with broad expanses of open space. I think this demonstrates the growth and utility of the landscape urbanism theory/discipline — in the absence of an economy to build a new framework for a city, we can use its natural assets until something else emerges. To me this is not just innovative, but almost revolutionary. Think about it: no other major city in the country would make that statement. Whether this plan ever sees effective implementation is anybody’s guess. 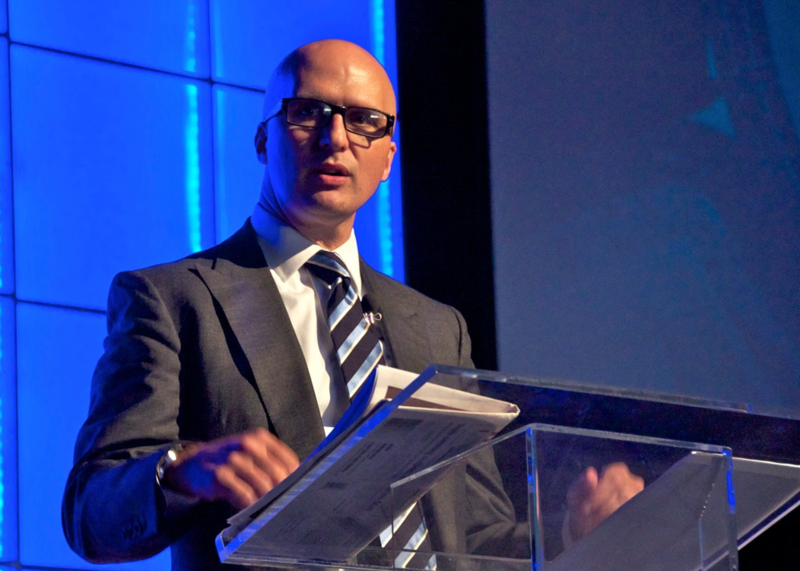 The philanthropic community is behind it, and so are the city’s corporate leaders. But I fear the political leaders and grassroots residents still aren’t behind this in the way they need to be. I think this is the most realistic plan to come out of Detroit in a long time. It is honest. Decommissioning neighborhoods sounds a bit radical, but if you’ve ever walked through these neighborhoods – as I have – they are already decomissioned. Getting from denial to acceptance is the first step. I haven’t read through the book but I wonder if it addresses structural problems that block the city’s growth like high taxes and labor costs. Detroit needs to be competitive with city services. Why live there if the schools and police don’t work we’ll but cost more in taxes than the suburbs? Why not just move to Southfield or Ferndale? @pete-rock, thanks. Maybe by the time I got to the blue/green infrastructure pieces, my patience for horizontal scrolling to read each page was fading fast. @James, I think this is a big issue around services. Chicago, et. al. may lag and key areas, but have highly differentiated environments and superior services to the suburbs in many ways (street lighting, sidewalks, snow clearance, fire protection, for example). I’ve always said that the people in Indy haven’t faced their core dilemma which is that their urban core is selling an inferior product (poor public services in an “urban lite” environment) at a higher price point. This problem affects Detroit and many other places as well. I was a member of the Detroit Future City technical planning team. One point of clarification: the employment target citing “2 or 3 jobs for every resident” was published in error. Detroit currently does have roughly 4 residents for every job within the city (714,000 residents: 193,000 jobs – see graphic in Economic Growth spread 3 [p.36]). The target that the Initiative for a Competitive Inner City (ICIC) set was to double the number of jobs in the city, establishing 1 job for every 2 residents in order to make Detroit competitive with comparably sized U.S. cities (again see graphic on p.36). The error in the Executive Summary citing “2 or 3 jobs for every resident” was caught a week before release. We were able to correct all of the print versions of the report, but the incorrect PDF was posted to the website in error. The corrected PDF has subsequently been posted. Thanks for the insightful commentary and comments; the on-going dialogue generated by the release of DFC will continue to inform the implementation of the framework. I would have liked to have seen a more in-depth plan of action for driving job growth and neighborhood development as part of this plan. Also, the plan seemed more like a book on best practices in urban planning than a unique strategic framework for Detroit to regain some level of competitiveness with other cities in the region, state, and nation. I will be curious to see how long this plan stays around; with the threat of an Emergency Financial Manager looming, and the Mayor at risk of losing any re-election bid in 2013, this plan may be short lived (much to the chagrin of The Kresge Foundation, which largely bank rolled this effort). In the end, Detroit will want more rail, because in the long run it’s going to be cheaper to maintain than asphalt. But right now they have *SO MUCH ROADWAY* that bus service makes sense. I particularly like the plans for rebuilding the major roads. They are SO wide right now that there is frequently room for sidewalk, bike lane, large green open drainage ditch, bus lanes, and *still* a lane of general-purpose traffic each way and a parking lane in each direction. Despite all his sins — he sure has no interest in democracy — Governor Snyder is the sort of man who seems to pay attention to the interests of powerful organizations funded by rich businessmen, like The Kresge Foundation. I wouldn’t be surprised at all if the plan does, in fact, get implemented — but perhaps in a much more “damn the torpedos” manner, with residents in the “decomissioned” areas facing immediate service cutoffs rather than the gentle, voluntary withdrawal which the plan suggests.